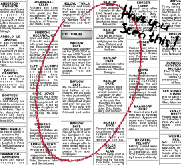 Examples of classified ads and how they can be used. Most companies have an intranet site which has many application uses. For example, to provide access to an electronic version of the staff newsletter, post information updates or internal processes. This internal network infrastructure can include links to employee advertisements or classified ads. Staff can list personal items for sale, seek out private services, network socially or announce births, marriages or anniversaries as well as a training and recruitment marketing tool. Classified advertisements normally contain a brief outline of the item or service being offered and contact information and are categorized into sections. Employees can be provided with online advertising guidelines and examples of advertisements or examples of classified ads to facilitate efficient usage of the intranet.